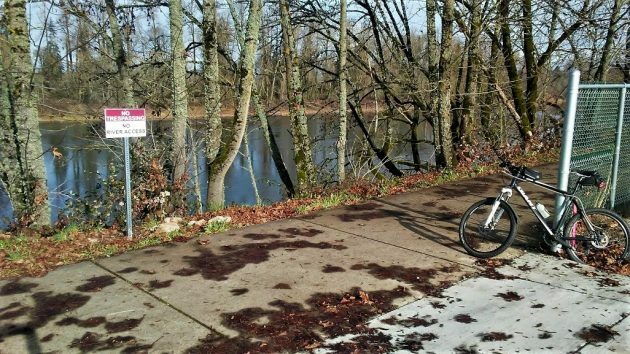 With the riverside foliage gone, the Dave Clark Path offers a good view of the Willamette River. The signs went up this week where the path runs along the Edgewater Village subdivision. The question of citing unwanted campers came up during a Nov. 5 city council meeting. The steeply sloping bank below the path, down to the high water line, belongs to the Edgewater property owners. The developers had offered the bank to the city as a gift, but the council declined. If the bank was public property, city authorities under a recent federal court ruling (in Idaho) probably could not bar people from sleeping there. 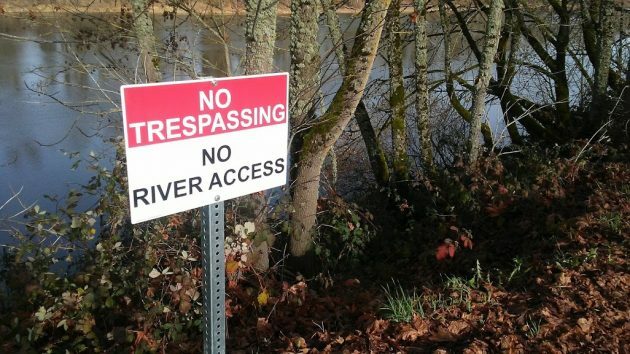 But private landowners could prohibit trespassing, and if they saw anybody there they could call the cops. And that, I presume, is why the no-trespassing sign are now in place. The city didn’t put them up, and neither did an Edgewater homeowner who in September organized a meeting with city officials about the messes left by unauthorized campers below the path. Which leaves the Edgewater developers or homeowners’ association as the likely party. One of the new signs on the river side of the Dave Clark Path. Reminds me of that song long ago…”Signs, Signs, Everywhere Signs…” I think it goes. Why doesn’t the city open it’s vast lobby to a warning center?? There is a large entry way outside the front lobby that could make a comfy apron for those down & out souls to camp on! Show us an shining example City Council!!?? They can’t do that because the city, with all their “compassion,” has barred homeless people from downtown. Pure BS & you know it! Oh, you know it all, I see, including what other people think. The new rule making it possible for homeless people in the downtown area to be questioned by police just for being there is meant to keep them out of the area, “and you know it”… to repeat your phrase. Rule is the wrong designation. Sorry. You know what I’m talking about Hasso…it is the new zone downtown where people who appear to not belong there, per the gentrification/CARA type authorities, can be stopped and questioned, and I think made to leave if they have more than one citation for loitering (and I’m sure for other things) in a certain period of time. You seem to be referring to the “enhanced law enforcement area” enacted by the city council in 2018. It does not refer to people being “stopped and questioned.” Instead, it says that if someone is convicted — convicted — of three offenses within the specified area over six months, the municipal court may bar that person from the area for up to a year, except to visit necessary services. Sleeping on public property no longer qualifies as one of the offenses that count against the three crimes or violations that can trigger the court’s exclusion order. “You may use any navigable waterway, as well as the submerged and submersible land along it, for any legal activity. For example, you may pull your canoe or kayak up on the land below the line of ordinary high water for a short period of time. Similarly, below the line of ordinary high water, you may picnic, walk, fish, play or sunbathe on the land. We have been putting up with people coming on our farm along the river since 1974 – – they throw everything from old tires, couches, garbage in bags, and everything else. The people who lease my land have to clean up the CRAP before they can do their farming. Hasso, Thank you for the explanation of the current state of the “enhanced law enforcement area” downtown. I didn’t know that it had been modified so that sleeping on public property was not one of the three offenses that can cause a person to be barred from downtown for a year. Or, maybe it was always that way; I don’t know. It seems to me that you did know what I was taking about, even though I erroneously called it a “rule,” rather than the “enhanced enforcement area ‘act’ ” or whatever triggers the courts to cite a person regarding this area act. Wow, that is a mouthful. How vague can one rule (there’s that word again) get?